The human body has to be one of the most beautiful machines that there is. But like any fine-tuned piece of machinery, it is not without failings that can sometimes carry painful consequences, such as the devastating effects of Duchenne muscular dystrophy. The doctors and researchers whose sterling work has helped to improve the lives of so many sufferers of this genetic disorder have shown an extraordinary determination in their medical quest. At URWERK, while our forte is just balance wheels and pinions, we share that very same drive and a desire to instil that little extra something in our creations, investing all our passion and savoir-faire. However, to dedication and know-how, we must add the financial means necessary to make progress. 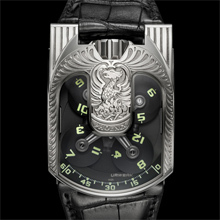 That is why Felix Baumgartner, master watchmaker and URWERK co-founder, is proud to announce URWERK's presence at Only Watch, the charity auction to benefit research into Duchenne muscular dystrophy, held in Monaco on the 22nd of September 2011, under the patronage of HSH Prince Albert II. 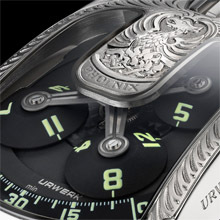 As an expression of commitment to the Only Watch cause, URWERK will be auctioning the UR-103 Phoenix, a unique timepiece made of white gold and hand-decorated by master engraver maker Jean-Vincent Huguenin, one of the most gifted artists in this field. Fascinated by universal cultures and legends, Jean-Vincent did not take long to decide on the theme of this mythical bird, revered in Ancient Greece as well as being a legendary hero in China and Japan. In his steady hand, Jean-Vincent has been able to conjure up one of URWERK’s iconic creations and give it a new, universal dimension. And so, in recognition of all those engaged in the battle to save children from muscular dystrophy, the UR-103 sports that most quintessential symbol of resistance and resilience: A phoenix rising from the flames. Dial Side. The time on the 103 is indicated by the orbiting hour satellites as they pass the arc of the minutes. The slanting sides of the hour satellites ensure an unencumbered view of the time without turning the wrist - even while driving - while bold SuperLumiNova provides excellent visibility by both day and night. The rotating satellite complication is the heart and soul of the 103 series of watches. The orbital cross carries the four hour-satellites and an internal Geneva cross governs each of these satellites. These Geneva crosses offer very low-frictional properties but must be manufactured to extremely precise tolerances. Each of the satellites features three hour numbers. As a satellite approaches the crown, its Geneva cross engages a pin which rotates the disk 120° so that the new hour takes its position. High-tech grade 2 titanium is used extensively throughout the satellite complication including in the construction of the orbital cross and the Geneva crosses. 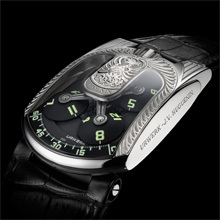 The strength and lightness offered by titanium provides lower inertia and improves the synchronicity of the movement. The hour satellites are crafted from aluminium. Integrated lugs holding the strap ensure that the sleek case fits comfortably on a wide variety of wrist shapes and sizes. Control Board. The Control Board on the back of the 103 features the following indications and functions: The Chrono Meter with its dual 15 minute and seconds dial for maximum precision when setting of time. The 36 hour Power Reserve indicator. A Fine Tuning screw which allows the user the possibility of adjusting the watch's timing +/- 30 seconds per day.